All items in the slideshow are from the collection of Jean Schugart-Schild. This is a continuation of her father's, Gilbert S. Schugart's photo archive of his sailing years as Chief Officer on many of Grace Lines' Santa ships. There are several slideshows on my website of his career starting with his training aboard the schoolship U.S.S. Annapolis from the Pennsylvania State Nautical School 1938-1940. Please enjoy his rich history at sea. Check my Listings page for titles and use my search engine. There will be at least one more posting on the Santa Rosa starting for September of 1953. A briefer photo essay on the Santa Isabel will be posted in the future. And there will be yet another photo slideshow on the farewell dinner that Gil and his wife attended for Captain Duncan Cook of Grace Line's in August of 1953. Duncan sailed for Grace Line 49 years. Use your cursor to Pause the slideshow at anytime to have a slower look at the photos of crew, passengers and some ports. I have not posted all the photos but I have added additional names of some passengers not seen in the photos. Thank you for taking the time to visit my website. Feel free to 'Like' the articles you see on the Facebook icon, or leave a comment. Photos, postcards and Grace Lines advertisements are from the collection of Jean-Schugart-Schild. Most of the regular photos were taken by her father, the Chief Officer on several Santa ships heading out of New York to South America. Most notably his photo archives are from the S.S. Santa Barbara followed by the S.S. Santa Rosa. Photos will be displayed in upcoming posts. Check out www.cruiselinehistory.com for excellent details on the history of Grace Lines, and other historic travels. Gil liked to cut and paste many of these Grace Line illustrations in scrapbooks. Some of these in the slideshow folded out into larger drawings, notably by C. Arnold Baer. My website is basic and so are my techie skills and tools for reformatting an illustration. Here is a photo that will also be in future posts. It is aboard the S.S. Santa Rosa in August of 1952 with crew, captain and passengers near the fireplace on board. You can see an illustration of that room in this slideshow at least twice. Standing left to right: Julian Palacios, Dr. William MaGee, Gilbert Schugart (our historian); Seated left to right: Passenger: Linda Cappabianca, Captain Siwik (in 1959 he will collide the Santa Rosa off the Jersey Shore in fog); Passenger Maureen O'Donnell. Place your cursor over the 'Grace' lady to begin the slide show. All items shown in the slideshow are from the collection of Jean Schugart-Schild. Enjoy the historical archives of the late Gilbert S. Schugart, U.S.N. R., Merchant Mariner, Chief Officer aboard Grace Lines S.S. Santa Barbara 1947-1952; Chief Officer S.S. Santa Rosa 1952-1954; Chief Officer S.S. Santa Isabel 1955-1956. For the complete list of the ships he sailed upon as a crew, including during WW II, see PART 1: SANTA BARBARA. Much of Gil's sailing history is posted on my website, starting with his schoolship training 1938-1940 on the U.S.S. Annapolis, under the Pennsylvania State Nautical School. Also posted are the stories of his mother's death to the 1918 Influenza Pandemic when he was 18 months old, located under my Guest Page: Seven Day Memoir. The story of his wife is posted in: Hellzapoppin'. Enjoy all of these written and pictorial essays. Admiral Immanuel Holger, Chief of Chilean Naval Mission to the U.S. Pause slideshow at any time by using your cursor to the Upper Left Side of the Photo. The late Gilbert S. Schugart, U.S.N.R., Merchant Mariner, Chief Officer trained on the schoolship U.S.S. Annapolis 1938-1940 (see pictorial essay at this site). He worked for Grace Lines and sailed on the following ships but this present post will be specific to the title above. More years will follow in future posts. S.S. Lara, approx.. April 1945-August 1946; M.V. Cape Frio 1946-1947; S.S. Santa Maria, briefly 1947; S.S. Santa Barbara, Fall 1947-May 1952; S.S. Santa Rosa, May 1952-January 1954. S.S. Isabel, 1955-1956. Gil went to work for the National Cargo Bureau at the Port of New York from 1956-1983 when he retired as a Chief Surveyor from the New York City office where he worked in the World Trade Center, North Tower and at the port itself inspecting ships cargo holds. In July of 1943 at the time of Gil's marriage to the 'Hellzapoppin' performer (see post at this site) Eleanore DeLuca at New York City's infamous "The Little Church Around the Corner" he was an Ensign in the U.S.N.R. and a 2nd officer with Grace Lines. In his 1990 reunion for the Navy Memorial (Washington, DC) he was listed with services from 1938-1958 LT U.S.N.R. After the war you would think Gil was ready for land but he stayed on with Grace Lines. Photographs et al are from the collection of Jean Schugart-Schild. I have included in the slide show a passengers list from the August 19, 1949 Voyage #53 on the S.S. Santa Barbara, along with photos of some of the crew and passengers on that list. They sailed out of New York to Cristobal, Buenaventura, Puna, Salaverry, Callao, Arica, Antofagasta, Chanaral, Valparaiso. In the future the photos will be even better of crew, ship, cargo and passengers at the Captain's table. What a life! I feel honored to post Gil's photos and wish he was here to see what the internet has now a days to honor the fantastic men and women of his favored life as a Merchant Mariner. God Rest Gilbert S. Schugart. Enjoy what he has left for you to see. Simply place your cursor over the first picture to 'Play' the slideshow. All photographs are in the collection of Jean Schugart-Schild. Enjoy the slide show below. 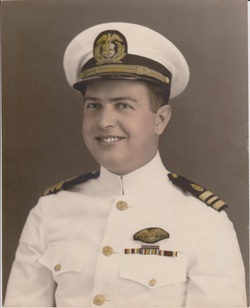 After his schoolship training from 1938-1940 with the Pennsylvania State Nautical School aboard the U.S.S. Annapolis, he began a twenty year 'sailing' career working for Grace Lines. As a merchant mariner he was instrumental in getting supplies and military personnel from port to port during World War II. 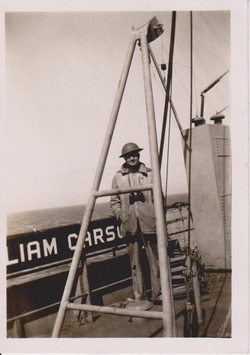 After the war, Gil began his work aboard Grace Lines 'SANTAS' cargo/passenger ships. The ones he was aboard were considered 'Grace in the Western Hemisphere.' But that is for the next posting. For now we will explore, through Gil's photos, his and his fellow cadets sailing and training. Gil wrote names of ports, dates, other ships, and crew on his photos. He was a true historian. These are only a small portions of what is in the collection. If you want to know about Gilbert's early start in life without his mother to raise him, please read under my Guest Page the story titled: 1918 Influenza :A Seven Day Memoir. And if you'd like to read about the woman he married, please enjoy the story: Hellzapoppin: Eleanor DeLuca Pictorial Essay. Feel free to leave comments. Enjoy the slide show that will take you from the Philadelphia Navy Yard of 1938 to ports in Yorktown, Virginia; Guantanamo Bay, Cuba; Port-au-Prince, Haiti; Kingston, Jamaica; Washington, D.C. Navy Yard; Fort Sumpter, S.C.; St. George, Bermuda; Long Island Sound; Fort Schuyler, New York, and San Juan to name a few ports. See training activities: coaling the ship; manning the ash whip; tripping the anchor and heaving ash. Class of 1940 yearbook for Gilbert S. Schugart upon graduation: "Sweetstuff is employed by the Grace Lines." Everyone had a nickname. Gil welcomes you aboard.